Slime mold is the common name for any of the members of a polyphyletic grouping of heterotrophic, fungi-like amoeboid (that is, like an amoeba) organisms that have an alternation of generations life cycle and where at some point separate single-celled protists create a large multicellular or multi-nuclear body. There are two principal forms. In plasmodial slime molds (myxomycetes), individual cells fuse such as to make one large supercell with one large membrane surrounding numerous individual nuclei. In cellular slime molds (Acrasiomycota and Dictyostelida), the individual cells aggregate but retain their individual cell membranes. Both the individual cells and the aggregate bodies are motile. 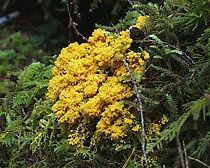 While slime molds have a life cycle that resembles that of fungi, and once were classified in that group, they now are considered unrelated to the fungi and generally are classified with the Protista. The common name slime mold traces to the part of their life cycle in which their appearance can be gelatinous (hence the name slime). However, this mostly refers to the myxomycetes, which are the larger, macroscopic slime molds. They have been found all over the world feeding on microorganisms that live in dead plant material. For this reason, it is very common to find these organisms growing in the soil, on lawns, and in the forest commonly on deciduous logs (hence the name molds). They also are common on mulch or even in the leaf mold in gutters. In tropical areas, they may be common on inflorescences, fruits, and in aerial situations (that is, in the canopy of trees). Most myxomycetes slime molds are smaller than a few centimeters, but the very largest reach areas of up to thirty square meters, making them the largest undivided cells known. Many have striking colors such as yellow, brown, and white. Slime molds offer important ecological functions as significant decomposers and nutrient recyclers, and as part of the food chain, consuming microorganisms and moving this food energy into the food web, as they are consumed by larger animals. Notably, in the case of the cellular slime mold Dictyostelium discoideium, nematodes can consume individual cells, but the multicellular form offers protection from their predation. Some of the individual cells sacrifice themselves to form the stalks of the multicellular body. For human beings, some of the larger slime molds also have some colorful and unique structures that add to the wonder of nature. Myxogastria or myxomycetes and Protosteli: Syncytial or plasmodial slime molds or protostelids. Dictyosteliida: Unicellular slime molds or dictyostelids. Acrasiomycota: Slime molds that belong to the supergroup Excavata as the family Acrasidae. They have a similar life style to Dictyostelids. Labyrinthulomycota: Slime nets that belong to the supergroup Chromalveolata as the class Labyrinthulomycetes. Plasmodiophorids: Pparasitic protists that belong to the supergroup Rhizaria. They can cause cabbage club root disease and powdery scab tuber disease. In more strict terms (sensu stricto), slime molds conform the group of the mycetozoans (myxomycetes, dictyostelids, and protostelids). However, even at this level there are conflicts yet to be resolved. Recent molecular evidence shows that the first two groups are likely to be monophytelic; however the protostelids seem to be polyphyletic also. For this reason, scientists are trying to elucidate the relations between these three groups. Slime molds exhibit an alternation of generations life cycle, in which one phase consists of a motile, feeding and growing animal-like phase and the other phase is an immotile, plant-like reproductive phase. This life cycle superficially resembles that of fungi and involve in the plant-like reproductive phase the forming clusters of spores, sporangia, often on the tip of stalks, leading to the release of spores to produce new single cells and begin the life cycle again. Slime molds can generally be divided into two main groups: plasmodial slime molds and cellular slime molds. Plasmodial slime mold. A plasmodial slime mold involves numerous individual, flagellated cells that are attached to each other, fused to form one large membrane. This "supercell" is essentially a bag of cytoplasm containing thousands of individual nuclei. Plasmodial slime molds, characteristic of myxomycetes, begin life as amoeba-like cells. These unicellular amoebae are commonly haploid and multiply if they encounter their favorite food, bacteria. These amoebae can mate if they encounter the correct mating type and form zygotes, which then grow into plasmodia that contain many nuclei without cell membranes between them. These multinucleate masses of protoplasm, plasmodia, can grow to be meters in size. One variety is often seen as a slimy yellow network in and on rotting logs. The amoebae and the plasmodia engulf microorganisms. The plasmodium grows into an interconnected network of protoplasmic strands (Ling 1999). The plasmodium can move around by amoeboid movement. Within each protoplasmic strand, the cytoplasmic contents rapidly stream. If one strand is carefully watched, the cytoplasm can be seen to slow, stop, and then reverse direction. The streaming protoplasm within a plasmodial strand can reach speeds of up to 1.35 millimeters per second, which is the fastest rate recorded for any organism (Alexopoulos 1962). Migration of the plasmodium is accomplished when more protoplasm streams to advancing areas and protoplasm is withdrawn from rear areas. When the food supply wanes, the plasmodium will migrate to the surface of its substrate and transform into rigid fruiting bodies. The fruiting bodies or sporangia are what we commonly see superficially look like fungi or molds but they are not related to the true fungi. These sporangia will then release spores, which hatch into amoebae to begin the life cycle again (Ling 1999). A common slime mold that forms tiny brown tufts on rotting logs is Stemonitis. Another form which lives in rotting logs and is often used in research is Physarum polycephalum. In logs it has the appearance of a slimy webwork of yellow threads, up to a few feet in size. Fuligo forms yellow crusts in mulch. Cellular slime mold. A cellular slime mold involves amoeba-like unicellular protists that spend most of their lives as individuals. These ingest microscopic living organisms, such as bacteria and yeasts, or decaying plant matter. However, when a chemical signal is secreted, they assemble into a cluster that acts as one organism, which can crawl about to find a suitable location. Over 100,000 cells may aggregate into this multicellular mass, a pseudoplasmodium. Both Acrasiomycota (family Acrasidae) and Dictyostelida are cellular slime molds, although they are not considered to be closely related. The Dictyosteliida are distantly related to the plasmodial slime molds but have the very different life cycle of being cellular slime molds. The Dictyosteliida amoebae do not form huge coenocytes, and mainly remain individual. They live in similar habitats and feed on microorganisms. When food runs out and they are ready to form sporangia, they do something radically different than the plasmodial slime molds. They release signal molecules into their environment, by which they find each other and create swarms. These amoeba then join up into a tiny multicellular slug-like coordinated creature. In Dictyostelium discoideium, the single cells aggregate to form slugs of about 100,000 cells (Kessin et al. 1996). This slug-like organism crawls to an open lit place and grows into a fruiting body. Some of the amoebae become spores to begin the next generation, but some of the amoebae sacrifice themselves to become a dead stalk, lifting the spores up into the air. About twenty percent of the cells of Dictyostelium discoideium die in the formation of the stalk (Kessin et al. 1996). While nematodes feed on individual Dictyostelium discoideium cells, the multicellular development provides protection from nematode predation (Kessin et al. 1996). The Acrasidae have a life style similar to Dictyostelids, but their amoebae behave differently and are of uncertain taxonomic position. The Protostelids' life cycle is very similar to the plasmodial life cycle, but they are much smaller, the fruiting bodies only forming one to a few spores. The Plasmodiophorids also form coenocytes but are internal parasites of plants (for example, club root disease of cabbages). Finally, the Labyrinthulomycetes are marine and form labyrinthine networks of tubes in which amoebae without pseudopods can travel. Alexopolous, C. J., C. W. Mims, M. Blackwell, et al. 2004. Introductory Mycology, 4th ed. Hoboken, NJ: John Wiley and Sons. ISBN 0471522295. Alexopolous, C. J. 1962. Introductory Mycology. John Wiley and Sons. Karling, J. S. 1968. 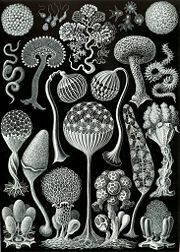 The Plasmodiophorales. New York: Hafner Pub. Co.
Kessin, R. H., G. G. Gundersen, V. Zaydfudim, M. Grimson, and R. L. Blanton. 1996. How cellular slime molds evade nematodes. PNAS 93: 4857-4861. Retrieved November 14, 2008. Ling, H. 1968. Light and fruiting in Didymium iridis. Mycologia 68: 966-970. Ling, H. 1999. Myxomycetes, commonly overlooked plants. Native Plant Society of NJ Newsletter Fall, p. 5. Lister, A. 1925. A Monograph of the Mycetozoa. New York: Johnson Reprint Corp.
Raper, K. B., and A. Worley Rahn. 1984. The Dictyostelids. Princeton, N.J.: Princeton University Press. ISBN 0691083452. Sleigh, M. 1989. Protozoa and Other Protists. New York: E. Arnold. ISBN 0713129433. Waggoner, B., and B. R. Speer. 1997. Introduction to the "slime molds." University of California Museum of Paleontology. Retrieved November 14, 2008.
nomen.eumycetozoa.com An online nomenclatural information system of slime molds (Myxomycetes, Dictyostelids and Protostelids) of the world. This page was last modified on 24 September 2015, at 15:22.